The Cisco Kid was a 30 minute western action series that was broadcast in syndication. It was about the adventures Of a masked hero and his friendly sidekick. They always won out over the bad guys but they never seriously injured them. That made the series a favorite of adolescent viewers. "Here's Adventure! ... Here's Romance! ... Here's O. Henry's famous Robin Hood of the Old West, The Cisco Kid!" 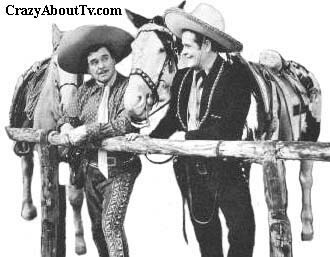 The Cisco Kid was the very first TV series to be filmed in color! The Cisco Kid TV show was produced by Ziv Television Productions who also produced, "The Aquanauts", "Bat Masterson", "Boston Blackie", "Man and the Challenge", "Men Into Space", "Science Fiction Theatre", and "Sea Hunt" among many others. In 1953, Duncan Renaldo (The Cisco Kid) was badly hurt in a rock fall and spent a considerable amount of time recovering in the hospital! He missed the filming of nine episodes so they used footage of him that had already been shot and used body doubles with masks over their faces or in some other way with their faces hidden from the camera. Duncan still did his lines from his hospital bed though! The Cisco Kid was based on a fictional character in the 1907 "O. Henry" short story titled, "The Caballero's Way". We all know the Cisco Kid from TV and movies as the brave Mexican hero but in O. Henry's story he was not Mexican and he was an evil outlaw! Duncan Renaldo was the fifth actor to portray The Cisco Kid. William R. Dunn played the part in two silent movies in 1914 and 1919. Then Warner Baxter played Cisco in four movies from 1928-1931. Cesar Romero ("Batman"/"Falcon Crest") was the next Cisco in seven movies from 1939-1941. In October of 1942, Jackson Beck landed the role on the Cisco Kid Radio Show that ran until 1945. Then finally, Duncan Renaldo starred in three movies in 1945. Jack Mather became Cisco on a second radio show that ran for an incredible 600 episodes over nine years! And, of course, in 1950, Duncan returned to star in this classic TV show. There were also Cisco Kid comic books and all kinds of merchandising products. Duncan Renaldo served a year in prison for illegal immigration in 1934! Although he probably should have gotten it straightened out, it's not as bad as it sounds. He was a sailor on a ship in the late 1920s when the ship caught fire and burned in a U.S. port. He didn't have the money to pay his way anywhere and, even worse, he didn't even know which country he belonged to! He had been orphaned in Europe and didn't know where he was born! He had a half dozen minor movie roles under his belt at Republic Pictures by the time he got thrown in the slammer and, luckily, the President of the studio signed him to a contract (making him employed) and vouched for him as being no danger to society and Renaldo was released. In 1936 President Franklin Delano Roosevelt granted him a full pardon and the nightmare was over! Thank you for visiting our The Cisco Kid page!